FILE PICTURE: Bank of Japan (BOJ) Governor Haruhiko Kuroda walks after meeting with Japan's Prime Minister Shinzo Abe at Abe's official residence in Tokyo, Japan January 11, 2017. WASHINGTON - Bank of Japan Governor Haruhiko Kuroda warned on Sunday that investors may be complacent about geopolitical risks that could trigger financial market turbulence and disrupt an otherwise broadening global economic recovery. Optimism over the global economy have driven world stock prices to multi-decade highs, with investors largely dismissing geopolitical risks like escalating tensions between North Korea and the United States. Speaking at a Group of 30 seminar, Kuroda said the global economic recovery was becoming more broad-based with rising trade and factory output spurring capital spending and private consumption. But he said policymakers had to be mindful of factors that could cloud the outlook such as falling productivity, weak inflation in many advanced economies and geopolitical risks. “So far, heightening geopolitical risks have not led to a serious risk aversion in the market. Asset valuations remain elevated with volatility being at historically low levels,” Kuroda said. “Stability in financial markets is good news. But there is a possibility that market players are complacent and not properly pricing risks, which requires attention,” he said. On Japan, Kuroda said inflation remained weak despite the economy’s moderate but steady expansion, which meant the BOJ would maintain its massive monetary stimulus for the time being. “Achieving our 2 percent inflation target is still a long way off. The BOJ will persistently pursue aggressive monetary easing, with a view of achieving its target at the earliest possible time,” he said. Kuroda was in Washington to attend the autumn International Monetary Fund meeting, where policymakers gave lukewarm endorsement to a strengthening global economy but conceded they were not out of the woods as they grappled with subdued inflation and low potential growth. Japan’s economy expanded at an annualised 2.5 percent in the second quarter on robust consumer and corporate spending, heightening hopes of a sustained recovery. But price and wage growth remain weak with firms still wary of passing more profits to employees, forcing the BOJ to push back the timing for reaching its 2 percent inflation target six times since deploying a massive stimulus programme in 2013. 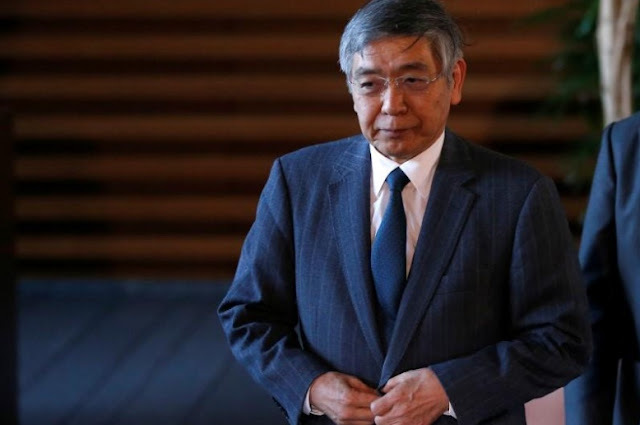 Bank of Japan Governor Haruhiko Kuroda warned on Sunday that investors may be complacent about geopolitical risks that could trigger financial market turbulence and disrupt an otherwise broadening global economic recovery.